When the weather starts getting nippy* and additional layers of clothes are required for keeping yourself from freezing to your couch, warm drinks are a perfect way to keep yourself thawed out. Of course, a little rum never hurts. Warm a mug or glass, and then add sugar and about 1.5 oz of hot water to the mug. Stir sugar and water until sugar is well-dissolved. Add rum and spices and then fill top the mug with hot water. Add butter and stir until butter is completely melted. Garnish with a cinnamon stick and/or orange peel, depending on the flavor you’re looking for. This isn’t the Hot Buttered Rum most people know. The majority of people making Hot Buttered Rum at home are probably using a store-bought “Buttered Rum Batter” of some sort that is designed to be mixed with butter, rum, and hot water. There’s nothing wrong with this approach, as the “batter” is just a combination of sugar and spices similar to what you see above. This particular recipe is much closer to Hot Buttered Rum’s roots. Rum, butter, and hot water appear in Jerry Thomas’ mid-19th Century bar guides as “Hot Rum” and “Hot Spiced Rum” – both largely following the instructions here. These instructions were cribbed from Chris McMillan, Master bartender from New Orleans, and one of the founders of the Museum of the American Cocktail. In fact, you can see Chris make one of these concoctions through the magic of the Internet! 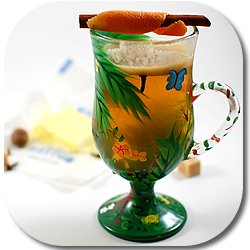 There are endless varieties of Hot Buttered Rum. Darcy O’Neil from Art of Drink recommends trying this basic recipe but substituting hot apple cider for the hot water. Zig Zag Cafe, in Seattle, makes them using a batter consisting of vanilla ice cream, sugar, more sugar, spices, and vanilla extract. Blair Reynolds, of Trader Tiki fame, likes to use a touch of salt in his batter, and Jeff “Beachbum” Berry includes a recipe in his upcoming book that involves hot tea, lemon juice, and maraschino liqueur! 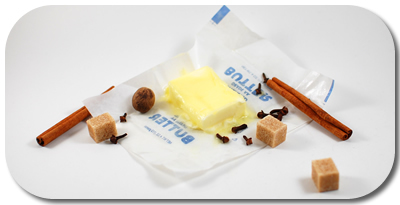 How do you like to make your Hot Buttered Rum? I knew I forgot something. Footnote added. I make mine in huge batches – this fills 6 12-oz containers for use at Thatch or to give to friends. Combine sugar and spices. Add the sugar mixture to the softened butter in a stand mixer 1 cup at a time at medium speed. I’m down to my last 2 tubs, time to make another batch! I like to use good strong black tea in place of the water. I tend to follow the Volcano House recipe using marschino liqeuer and lemon juice. I’ve stayed at the Volcano House but didn’t know at the time they were so famous for their hot buttered rum. I’ve never made hot buttered rum using a batter. I agree that it seems like too much forethought for a cocktail, especially when we get so few nippy* days here in California. Who has time to prepare? Craig: I’m going to have to try that batter, but scaled down a tad. Paul: The Volcano House is the HBR variant that Jeff Berry turned me on to very recently, and will appear here on the site very soon. Oh, +1 on HBR made with good black tea. Even better, if you happen to live anywhere near a Peet’s Coffee & Tea (mostly NorCal but other places as well), pick up a tin of their “Winter Solstice” — an amazing blend of black tea, spices, vanilla and dried citrus available only during the holidays. It’s practically all you need. Today is the day for this in the Northeast…. I tend to go with fresh orange instead of lemon…and I use agave syrup instead of sugar. Oh…I also use a little less butter (personal taste preference). In my Bar, we make it with organic appeljuice and Old Monk Rum from India! I can’t believe no one mentioned using a hot poker to boil the mix. It’s a bit messy, but it sure is fun, and it definitely adds something. I didn’t make any this fall/winter, so I’m off to the kitchen to whip up the one you posted. *I’m a desert rat, so nippy for me is anything below 90* F.
Speaking of the Zig Zag, Seattle… All cocktail enthusiasts should know about Murray Stetson and his contributions to the cocktail culture in the US. You should also be aware of his health condition and what the global hospitality industry is doing to help him!